Very obviously every country chooses to advertise movies in a different way. Same thing with books. 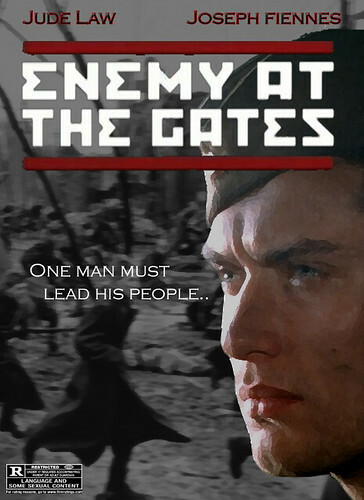 I thought it might be interesting to pick a movie, Enemy at the Gates in this case, and just look what I come up with. It’s interesting, dont’ you think? I can’t quite figure out which is which, apart from the last one, of course, that is the French poster. Now in France they even chose another title. Stalingrad. Which is the one that you prefer? Which one captures the story best? I think I would prefer the third one if it had been Ed Harris’ instead of Joseph Fiennes’ face, although… I am not sure. This entry was posted in Movie, War Movie, War Movie Posters and tagged Enemy at the Gates, Movie, Movie Poster, War Movie. In order of preference, 3 – 1 – 5 – 2 – 4. I like #3 the best because it features the two main characters, the city, and the sniper aspect. It’s also the one I am used to as it is the cover of my VHS copy. I’m guessing it’s the U.S. poster. Kudos, this is a fascinating topic. Guess I agree pretty much with your ranking. Although I remember having seen a German one that was very convincing. 3 is the US poster but is used throughout the world. I saw it with Spanish and I think Dutch titles but the rest was the same. It is a fascinatiing topic and would deserve more careful analysis. I landed on a French College page yesterday where the kids analyzed the French one as if it were a painting. Was quite interesting. I realized that very often when there is a love story invoved you will find posters with and without the woman.